Enjoy stunning views of Mirror Lake surrounded by sandstone cliffs and towering pines. This fabulous 1200 square foot home has knotty pine throughout; great room with massive fieldstone gas fireplace, sun porch, fully equipped kitchen, master bedroom and separate kids' room and deck with grill. There is an outdoor fire pit. Tall Pines Villa also has WIFI. PARKING LIMITED TO 2 CARS ONLY!! Cant wait to do it again i am only fearful of trying one of your other properties after how great this experience was It was very nice. The pictures of the outside actually made me nervous after booking and I expected the worst. But the place was very nice. Ac was cold fireplace was warm. The only thing i think could help is telling people to bring seasonings and tin foil for cooking. Other than that we were very impressed with the entire situation. We will do it again for sure. Marci is the greatest! She's always quick with an email response and very helpful. We loved it and we will definitely be booking a property in the future! Enjoyed thoroughly our stay at Sand County! We'll be back We have several friends that have not gone to the Dells and have always wanted to. We can now recommend a good place at a reasonable value. The staff was pleasant & very helpful when needed any assistance! We loved the stay! It definitely was better than staying in a hotel! Upon our arrival we were greeted by a very friendly young gentleman. He explained the whole process to us and we couldn't be more pleased with the ease of check-in and check-out procedure. My family loved our stay and wants to return again next year. Very comfortable cabin, clean, spacious, has absolutely EVERYTHING you could possibly need. Relaxing and well kept cottage. Love the secludedness away from the town. The staff members here were very friendly and helpful. I consistently had pleasant experiences when interacting with them; I had to call many times in advance to figure out specific details of the rental, and they did an excellent job of updating me with information and knowledge. They also let me know that it was possible for our group to check in early, and that was great for us. We loved staying at the Tall Pines Villa! The rental was spacious and able to accommodate all eight of us. It was extremely helpful that the kitchen utensils were available for us to use; this made packing for the trip much less stressful. We really don't have any complaints about our stay here; the rental was clean and bright, and all utilities were working efficiently. George was extremely friendly, welcoming, and helpful. We had a lovely weekend staying in the Tall pines cabin. The view from the back porch was gorgeous and we felt like we were in the northern woods even though we were just steps from all the shopping, dining, and fun. Our friends were impressed with how charming the property was and how close it was to everything including Cascade mountain. The cabin was darling with all the wood detail and stone fireplace which we used nightly after skiing all day. The kitchen was modern and spacious with more than enough cookware than we needed. The bathroom was overstocked with towels and we had more than enough to accommodate us for our stay. If you are planning a trip to the dells this is really the way to go, so much nicer than staying on a crowded resort! We plan on making this an annual trip! We had a wonderful visit in Tall Pines Villa! 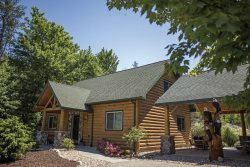 The private setting and cozy cabin made it the perfect get away from the busy downtown area. We can't wait to return in the future! Gentleman on duty was friendly and accommodating. Very nice experience with campfire every evening; cooking outdoors. Nice cabin with tv and dvd. Nice kitchen area with dishwasher. Enough room for all to sleep despite being a small cabin. Very nice and friendly group. We enjoyed our stay there and would definitely do it again. Kids loved the cabin and location.